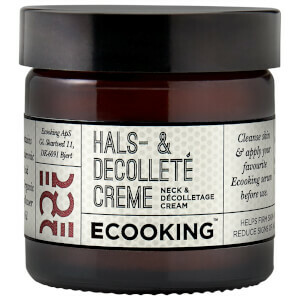 Address signs of ageing with the Neck & Décolletage Cream from Danish skincare brand, Ecooking. Utilising Hyadisine (a regenerative and protective bioactive ingredient), the quick-absorbing formula helps to minimise the appearance of fine lines and wrinkles for a smoother, younger-looking complexion. Deeply moisturising and hydrating, its blend of Hyaluronic Acid, Organic Sunflower Oil and Niacinamide (a derivative of Vitamin B3) targets age spots and sagging skin, whilst Ultra Soft Focus Cellulobeads promote a soft, plump neck, chest and décolletage. Helps to defend against further UV damage and hyperpigmentation. Apply to the neck, chest and décolletage after cleansing. Use morning and night. Aqua**, Cetearyl Ethylhexanoate, Sodium Lauroyl Glutamate*, Helianthus Annuus Seed Oil*, Cetearyl Alcohol, Butyrospermum Parkii*, Glycerin*, Niacinamide**, Cellulose**, Phenoxyethanol, Tocopherol**, Cyclohexane, Caprylyl Glycol, Sodium Citrate, Lentinus Edodes Extract**, Potassium Sorbate, Sodium Benzoate, Phytic Acid, Pseudoalteromonas Exopolysaccharides**, Sodium Salicylate**, Citric Acid**, Triethanolamine.